Awesome. Not only that, a great marketing ploy. This was not a mistake. It was the idea of an ingenious marketing guy. 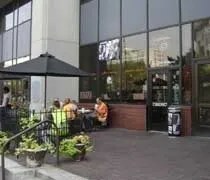 In fact, the Company made it appear as if they had blown up a competitor’s restaurant right next door, because “all casual dining restaurants have come to look alike, and the demo crew mistook theirs for ours.” It’s all a fun way to make the point that there is a better, fresher Ruby Tuesday, and it’s different from the rest. Now that’s funny! Ruby Tuesday finally woke up and realized what foodies have been saying for years. It doesn’t matter if they call it Ruby Tuesday, TGIFriday’s, Applebees, Bennigans or whatever, they’re all the same restaurant. So, what are they changing? Gone are the artifacts and memorabilia, the black-and-white checked tablecloths and the dark-stained woods. Now there is a clean and more contemporary look, with soft, earth-tone colors, upholstered seats that make you want to stay a little longer, specially commissioned artwork and photographs, and colorful, light-hearted lighting fixtures. On the outside, Ruby Tuesdays are now painted a uniform, pleasing color, accented with attractive black awnings. Ha Ha Ha….I loved that movie.